mikuni 24mm TM flat slide carburetor, perhaps one of the most revered of all carbs for its flawless quality and performance. perfect for all 75 and 80cc kits - used heavily on puch gilardoni and metrakit, as well as derbis and mmm all those other ones. You got that BIG kit now you need a BIG carb to keep up with it's mighty thirst. This will do the trick. Easy to install and easy to change jets. Your big boy bike needs a big boy drink so get it one you hooligan. STOP PLAYING AROUND. 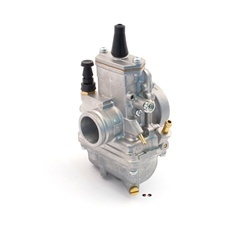 This carb comes with 15 pilot jet, 130 main jet, a 5N13 needle and 454 Q-0 needle jet. Using this on a 70cc sport tuned scooter. The switch over from pilot jet to needle seems a little on the rich side for such a small engine so I'll be ordering the next 2 smaller pilot jets, a leaner needle jet and another model needle. I'll be trying a 10 or 12.5 pilot, 4DH7 needle (which works better on smaller motors i hear cause they say it's thicker[but not from specs I see], shorter and starts to taper earlier), 454-P-8 needle jet(which is a leaner needle jet...fingers crossed) and I'm currently running without hesitation on the rich side with a 125 main jet, Hopefully I can get better low end modulation with it. Idles good right now and anything after 1/3 throttle it screams... wow! Ordering a choke cable adapter kit. Think I can get it to work. Well if you want to hang with the big boy's this is the carb! Had a 21mm phbg on my Puch Gila, then switched to this! WOW! veryveryveryvery nice! so easy, so solid, so awesome. Adjustments can be a pain and they are massive compared to a phbg, but for some reason they tune themselves and are super solid. Go big!